This valuable reference work synthesizes and elucidates traditional themes and issues in Islamic philosophy as well as prominent topics emerging from the last twenty years of scholarship. Written for a wide readership of students and scholars, The Routledge Companion to Islamic Philosophy is unique in including coverage of both perennial philosophical issues in an Islamic context and also distinct concerns that emerge from Islamic religious thought. This work constitutes a substantial affirmation that Islamic philosophy is an integral part of the Western philosophical tradition. Featuring 33 chapters, divided into seven thematic sections, this volume explores the major areas of philosophy: Logic, Metaphysics, Philosophy in the Sciences, Philosophy of Mind/Epistemology, and Ethics/Politics as well as philosophical issues salient in Islamic revelation, theology, prophecy, and mysticism. The result is a work that captures Islamic philosophy as philosophy. In this way it serves students and scholars of philosophy and religious studies and at the same time provides valuable essays relevant to the study of Islamic thought and theology. "Classical Islamic philosophy has focused for many years on a few main figures, such as Avicenna, Averroes or Ibn Khaldun and on key issues such as the eternity of creation or human immortality. This vision is not wrong but partial. The editors of this volume have succeeded in bringing into the study new matters of the Islamic tradition which continue to cause philosophical challenges today." "This is a wonderful collection of contemporary secondary sources on Islamic philosophy. It is a real boon not only for the specialists, but also for the scholars and students of the history of philosophy, especially those interested in ancient and medieval traditions." "In what promises to be a highly acclaimed volume, the editors have brought together a collection of essays that address the enduring questions in the Islamic philosophical tradition. Some of the most accomplished philosophers working in the field have treated most of the traditional topics and areas in Islamic philosophy; thereby making a major contribution to the growing field." "This is a well-informed guide through a long tradition of thought, a book teachers and students will want to keep within reach as they strive for greater familiarity with the larger domain of Islamic philosophy and its related disciplines." "This collection offers a unique, comprehensive, and illuminating set of essays that is sure to enrich students of classical and post-classical Islamic philosophy. The topical focus of the volume is especially effective for highlighting the vibrancy of Islamic philosophical tradition, and the editors have ensured that all areas of philosophy are amply represented. Also noteworthy is the inclusion of chapters on the philosophical significance of Islamic revelation, theology, and law. A must-read for both beginners and more advanced students in the field." "Because Islamic thought is not as well understood as it should be, this is a useful addition to the many companions to various authors, fields, and traditions put out recently by major publishers…One of the collection's attractive features is that it not only covers major topics (e.g., creation, freedom, and determinism) but also offers more focused analyses of technical issues, such as primary and secondary causality and the ethical treatment of animals… Summing Up: Recommended." 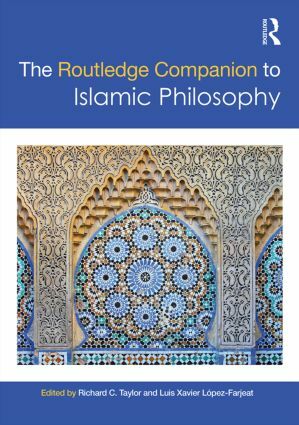 "All in all, the Routledge Companion to Islamic Philosophy is a comprehensive and solid introduction to the Classical Islamic tradition…One can only hope the compendiums such as this one will effectively make their way into the classroom." Richard C. Taylor is Professor of Philosophy at Marquette University and is former editor of History of Philosophy Quarterly. Luis Xavier López-Farjeat is Associate Professor of Philosophy at Universidad Panamericana in Mexico City and editor of Tópicos, Journal of Philosophy.